Why are pass-back or re-track detection and prevention important to your facility? Pass back or re-tracking is the act of gaining access to a facility via an exit. Anti-passback technologies detect and prevent an individual from gaining access to your facility through dedicated exits or points of egress. Isotec anti-passback Safety Entrances® and Exit Lane Breach Control systems use interlocking doors or mantraps controlled by Programmable Logic Controllers (PLC) to prevent re-racking into a facility from a dedicated point of egress. The lanes are programmed to let people leave but not enter a facility, such as an airport. When activated, sensors transmit signals to the PLC which in turn employs pre-programmed ladder logic to respond to the event. Upon detection, the PLC then locks the door into the facility and simultaneously signals security personnel of the attempted breach. It can also activate annunciators that can give direction to leave the area and go through the approved entrance area to enter the facility. Anti-Passback Access Control involves detection and prevention are critical functionalities for door access control systems. The Department of Homeland Security requires these functionalities to be approved as an Anti-terrorism Technology (ATT). Anti-passback detection and prevention are just two of the security features in Isotec Safety Entrances® that prevent unauthorized entrances. 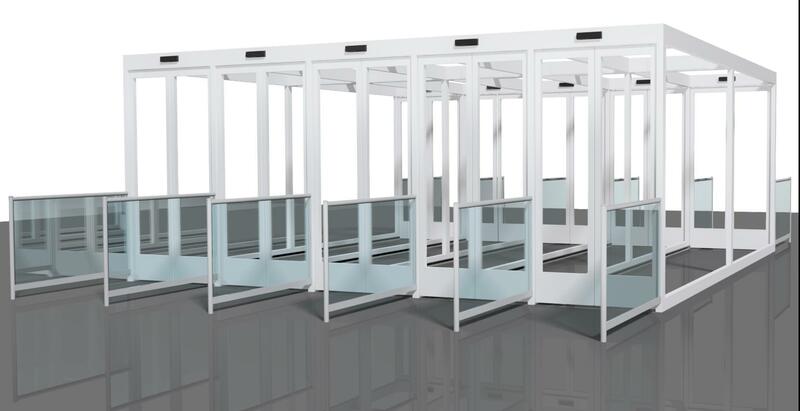 Isotec Safety Entrances® control entrances and exits at airports, courthouses, police stations, military installations, and commercial facilities. Our entrance control systems detect and prevent tail-gating and unauthorized re-track or pass back entrance into a facility. Our entrance control systems also prevent unauthorized persons with guns from entering a facility. Isotec’s Exit Lane Breach Control (ELBC) systems also enforces Anti-Passback Access Control and prevent people from entering facilities through unsecured points of egress. This is vitally important at airports and strategic facilities. Safety Entrances® ELBC systems can be ballistic rated. Airports commonly use “Anti-passback” technologies to enforce the flow of passengers exiting from the departures/arrivals area to the baggage claim or terminal exits. Anti-passback control systems use motion and presence sensors to detect persons loitering in areas that should be vacated. In addition, anti-passback access control systems use sophisticated video analytics to determine the direction of foot traffic. It cost approximately $250,000 per year to man exit lanes at airports with security personnel 24 hours a day. Automated anti-passback control entrance cost about the same amount. These systems pay for itself in 1 year. Isotec Security® incorporates technologies that ensure our anti-passback access controls are 100% effective.